Each surprisingly tidy 20x27.5x27cm WxHxD yet hefty 14kg Metis MkII contains a 5" long-throw mid/woofer and 1" soft-dome tweeter. Those hide behind a cloth grill which, a bit shocking for these self-professed luxury leagues, affixes with thick Velcro patches, not elegantly hidden magnets. 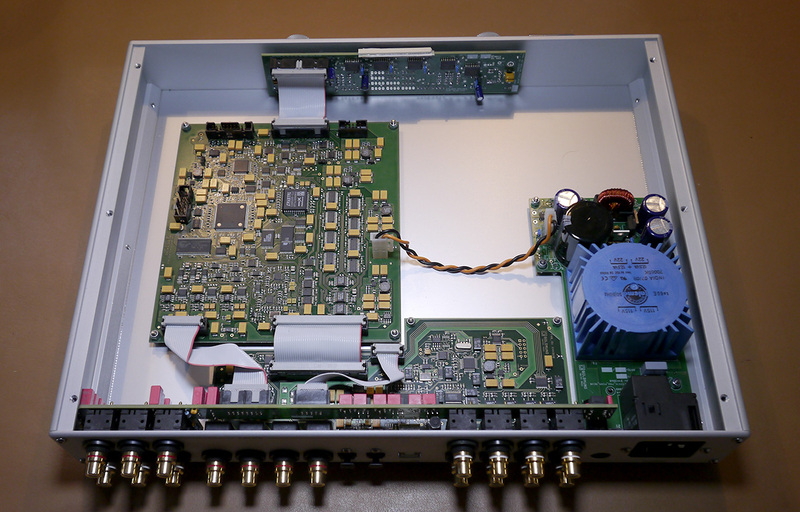 The back sports a screw terminal for the wireless antenna; one each S/PDIF coaxial input and output; an IEC power inlet; a 9-pin firmware input used only by the factory; and a small switch behind a hole which, when tripped via inserted screw driver, pairs a new dongle to the speaker's wireless receiver. The provided dongle of course arrives pre-paired. But if lost, this is how a replacement gets assigned to your specific speaker. The wired/wireless inputs are auto switched. Frequency response is given as 43Hz (-6dB) to beyond 25kHz. 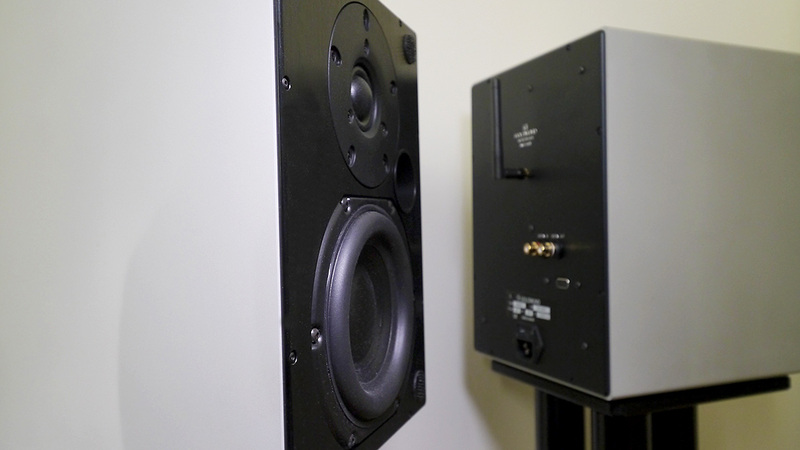 The 175wpc amplification draws a stated 240 watts in use. The amps auto-mute three seconds after not receiving a digital input signal and de-mute automatically when signal resumes. When turning off their mains power, the firm instruction is to wait three seconds after the music stops to avoid turn-off noise. Because the internal active circuitry runs high voltage gain, whenever volume control shifts to a PC during wireless dongle mode, attention must be paid to properly attenuate computer volume before hitting 'play'. Goldmund's vintage coaxial cable concept—the Kii Three uses Ethernet as does the KEF LS50 Wireless—could involve leashes longer than are typical for digital hifi. With my longest in residence just one metre, I asked Anne-Karine Agius to supply something longer. Their shortest suitable length in inventory just then was 10 metres so I 'ordered' one such pair. Obviously I'd also try the wireless dongle as the budget entry into the active Metis speaker range. For the Metis 10 digital controller, I simply wanted to go wired and bypass brain-numbing WiFi. 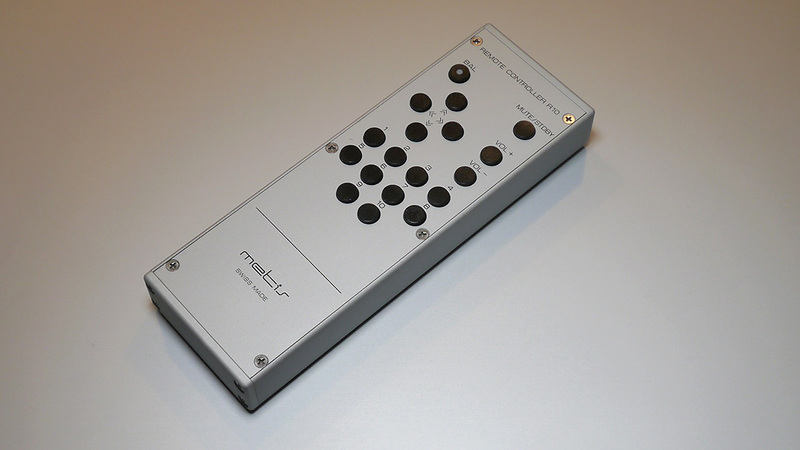 The Metis 10 controller hides its computational guts in a sleek one rack-space case which measures just 37x32.5x6cm WxDxH and weighs only 4.5kg. 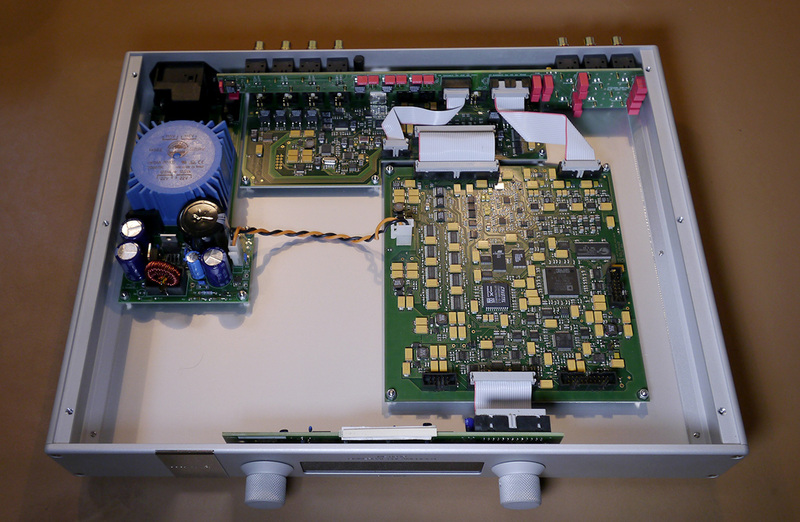 Distributed across three flat boards and one each upright PCB behind the front and back panels, there's a small power supply, a reclocked output module and the main processor board with large-scale integrated chips like an Analog Devices 32-bit floating-point Sharc, Cirrus Logic DSP and Cypress CMOS RAM. There's also a Burr-Brown PCM2903E 16-bit AD/DA converter with USB interface and a TUSB2036 hub. Because this device supports 8 digital multi-channel outputs (front l/r, rear l/r, sub 1-4), there are eight Cirrus Logic CS8406 digital transmitters. For external socketry, we get three RCA analog pairs, 4 x coaxial S/PDIF, 2 x Toslink and one USB (to play and for software updates via Goldmund's Universal Configurator). 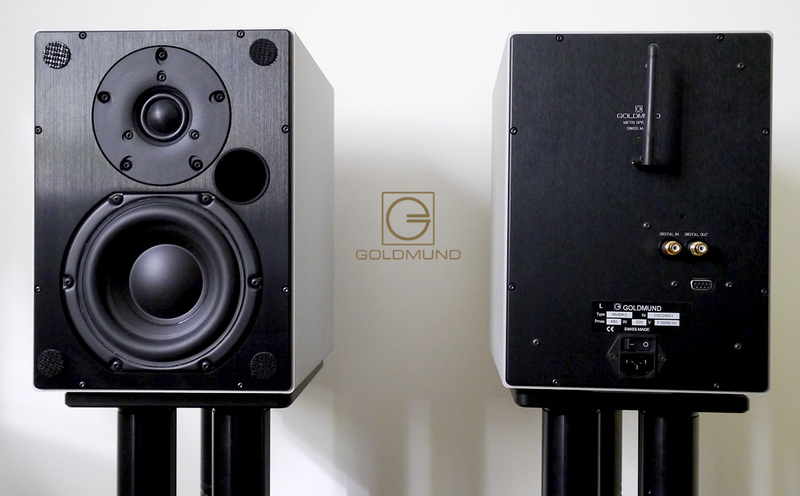 Input 'Analog 3' is configured as a thru-put to bypass Goldmund's volume control. The display confirms this with 'pp'. The included full-metal remote with RC5 code has direct access buttons for all 10 inputs, volume up/down, balance engage then left/right and front/rear adjusters plus a mute/standby control. Rubber bumpers protect whatever surface you put it on. Likely to conserve power during storage, the batteries had been installed kinked not to make contact. To get going, I had to remove the top cover and click the batteries into place. The two Metis 10 front panel controllers select input and volume respectively. Each setting shows numerically in the red-on-black display. Volume confirmations spans 0-99. That corresponds to 65dB and a claimed 0.05dB accuracy in the 0 to -34dB attenuation range. Max power consumption is 8 watts.